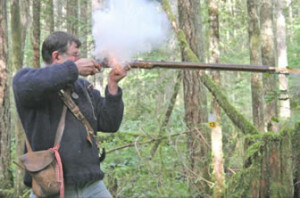 The Black Powder section is a group members who enjoy the challenge of shooting the guns (and replicas of them) used in the 1800’s and earlier. While the majority of us shoot primarily replicas of the guns of the fur trade, we also use replica of the muzzle loading guns of the British, American and French armies prior to the mid 1860s. (roughly the introduction of cartridge rifles). Muzzle loading means that we pour powder and ball down the barrel to load the guns. The powder can be ignited with either a flint lock or a percussion lock. Our competitions are called rendezvous in memory of the early summer gatherings of mountain men trappers to sell their hides and buy new supplies, as well as party and participate in competitions of various kinds. In addition to rifle shooting we also shoot muzzle loading handguns and compete for accuracy with tomahawks and bowie knifes. Please check the Calendar for Trail walks and the annual Rendezvous dates . June 29 to July 2, 2018 Nanaimo. New Shooters welcome to join in, test your skills, enjoy the comradry, and get helpful hints from experienced shooters.